Guests attending a dinner Monday night at Legal Sea Foods in Park Square will sit down to a meal of black tiger shrimp, cod cheeks, and hake. Billed as a dinner of “blacklisted’’ fish, it’s designed to bring attention — in a provocative manner — to the ongoing debate over what constitutes sustainable seafood. The dinner underscores the tensions between fishermen who believe regulations are too restrictive and conservationists who feel they don’t always go far enough. It’s a heated issue — at stake are people’s livelihoods and the viability of fish stocks — but now it comes with wine pairings. That wording has drawn the attention of conservation groups, chefs, and consumers concerned about the environmental impact of their choices. To some, the invitation reads as though Berkowitz is thumbing his nose at the notion of sustainability. Berkowitz said he simply wants people to take a more nuanced look at the issue. The Legal Sea Foods dinner — whose 55 attendees will include fishermen, chefs, marine scientists, writers, and people who are interested in food — offers species frequently included on conservation groups’ “avoid’’ lists. All appear on Legal’s menus, either regularly or as specials. The shrimp being served are farmed in Vietnam, where that industry has been blamed for past mangrove destruction, pollution, and other ills. But Berkowitz said the industry has improved, and he has inspected the operations from which he buys. Also being served are white hake and cod, species conservation organizations fear are being overfished. Legal Sea Foods will serve hook-caught hake and Gulf of Maine cod brought in by Gloucester day boats. Using smaller boats and hooks rather than methods such as dragging with nets lessens the environmental impact; serving cod cheeks uses a part of the fish’s head that might otherwise be discarded. 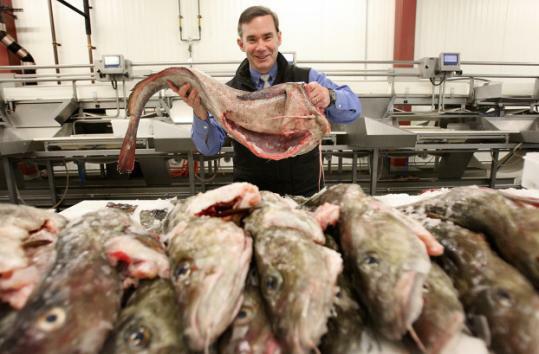 Tom Nies, senior analyst for the New England Fishery Management Council, said Gulf of Maine cod was not overfished as of 2007 (the most recent assessment data available), as it had been five years earlier. White hake, however, wasn’t rebounding as well. The dinner has certainly drawn attention to the issue. The Gloucester Daily Times ran an editorial applauding Berkowitz, while conservationists and bloggers took him to task. “This seems to be part of [a] troubling trend of cynics who say, ‘You can’t trust the hand-wringers,’ and ‘Forget the science — give me the last plate of bluefin,’ ’’ wrote one, Jacqueline Church, who organizes sustainable seafood events. Many considered the use of the word blacklist, not commonly employed by conservation organizations, to be inflammatory. On the website Change.org, someone started a petition titled “Tell Legal Seafoods: Stop attacking sustainable seafood!’’ Chefs Collaborative took a more measured approach. The organization posted an open letter thanking Berkowitz for starting a dialogue about sustainable seafood. It’s an issue on people’s minds. In a survey published last month by the food service magazine Nation’s Restaurant News, chefs named sustainability as a top trend for 2011. The word appears on menus all over Boston, as restaurants increasingly buy ingredients from local farmers and fishermen who favor low-impact methods. Last year, Whole Foods Market created a color-coding system to rate its seafood’s sustainability. In the United Kingdom, top chefs champion sustainable seafood on a new television series called “The Big Fish Fight’’; since it aired this month, sales of more-sustainable fish such as sardines have soared in major supermarkets there. And in the past decade, consumers concerned about eating sustainable fish have snapped up more than 36 million copies of a pocket guide created by the Monterey Bay Aquarium’s Seafood Watch program. Its iPhone app has been downloaded more than 426,000 times since 2009. But Seafood Watch recently adjusted its ratings on that species, giving Gulf of Maine hook-and-line Atlantic cod — the kind Legal is serving at the dinner — a “Good Alternatives’’ ranking. The health of species is constantly changing. To make an informed decision about what fish to eat, one needs to know exactly where it comes from and how it was caught. The guides are a useful starting point, based on information that comes directly from those managing fish stocks, said Seafood Watch director Jennifer Dianto Kemmerly. If there’s one thing everyone can agree on, it’s that sustainability is a complicated issue.